Well it's Bank Holiday Monday and we're at Kew Gardens for the day with assorted members of mine and Catrina's families. Everyone else has gone off to watch Morris Dancing (not really my scene!) so I thought I'd post a couple of photos. 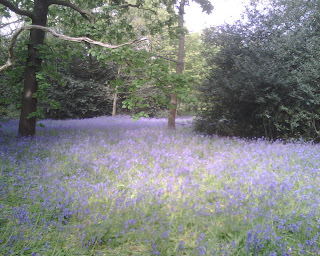 The first is of some Bluebells - Catrina thought people would like that. 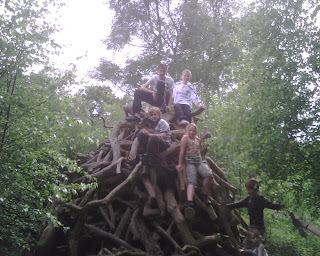 The second is all the children on top of a very insecure log pile - great fun! It's great to have a day to relax and reflect on Sunday - I'm so excited by what God is doing in our Sunday gatherings. For those of you there in the morning don't forget to be using the 5 love languages to express your love for someone else. After the relaxation of today I've got a really busy week, picking up Gordon and Gail Macdonald from Heathrow late Tuesday night after a Reading Family Church trustees meeting and hosting them for a day with the staff on Friday, the Men's day on Saturday, church on Sunday and a day for selected leaders and their partners on Monday. Then on Tuesday and Wednesday Ben and I are off to the Newfrontiers prayer and fasting at Peterborough. Please pray for me that I'll find time to rest properly in the middle of it all. For me I always find it quite scary hosting the leaders who come to us, whether it's Erwin or Kim McManus, J. John, Kay Warren, Rachel Hickson or any of the other leaders we've had in the last couple of years. My introverted side takes over and I'm terrified that I'll say or do the wrong thing! Yet at the end of the day they always turn out to be such nice and 'normal' people. I've met Gordon before so I know in advance how easy he is to be around so I'm not too scared this time! Hope you had a great bank holiday too and men, hope to see you on Saturday! God has put you and catronia in bracknell family church for a good reason only he knows what that is have confidence while you are with gordon and gail relax be yourself don't try and be someone your not. I will pray for you while you are away with ben in peterborough i am certain you will be refreshed.